1. Go for natural colours. Use only natural and home made colours during Holi. 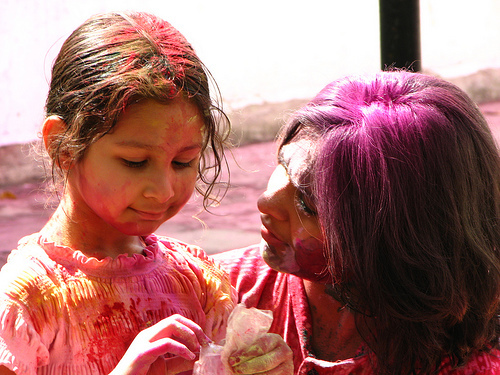 Using natural colours ensures that you do not harm your skin, eyes and hair while playing Holi. The non-natural colours normally used during Holi are chemical based and can cause harm. Such colours can not only affect your skin, eyes, hair, etc but also cause permanent disorder to your precious organs. Natural colours are available at various stores across the city. A lot of people have a habit of throwing small plastic bags and balloons filled with water on each other. Not only is hitting each with plastic bags and balloons harmful to the body’s external organs, the remains of the same causes considerable waste and environmental pollution. One should refrain from doing this and also stop others, especially children, from doing this. Share your natural colours with your friends and relatives. These make excellent gifts, even on the morning of the festival. Such sharing of eco-friendly colours will also encourage your friends and relatives to celebrate an eco-friendly Holi. Though cool splashes of water are worth enjoying, we should use it in limited amount. It is very necessary to avoid wastage of water on account of such occasions. Using natural colours is one of the best ways to avoid wastage of water as you do not require much water to clean these colours from your compounds, buildings, premises and your body, after the festival is over. A considerable amount of water can be saved in this manner. Play Holi with only those friends and neighbours who are using eco-friendly colours with least wastage. Send Holi SMSes and Holi cards to your friends with the message “An eco-friendly Holi is a Happy Holi”. Wish you a happy, safe and colourful Holi!